USS Confederacy, a 36-gun frigate of the Continental Navy was launched at Norwich, Connecticut on November 8, 1778. A beautiful ship with profusely carved ornamentation, she was plagued with bad luck throughout her career. In October of 1779, under the command of Captain Seth Harding, she was on a diplomatic mission to carry the French Minister back to France. John Jay (the first American Minister to Spain) and his family were also aboard. During the passage Confederacy ran into a hurricane near Newfoundland and was completely dismasted. Captain Harding managed to work the ship southward. She reached Martinique in mid-December with 6 feet of water in the hold. She remained there for several months for repairs. She returned to Philadelphia on April 20, 1780 only to find the need for more extensive repairs. In October, she was damaged once again in a collision with another ship in Philadelphia harbor. The year 1781 did not bring better luck. While homeward bound from the West Indies with military stores and other supplies, Confederacy was forced to strike her flag to two British ships- the 44-gun HMS Roebuck and the 32-gun Orpheus. She was subsequently taken into the British service as HMS Confederate. 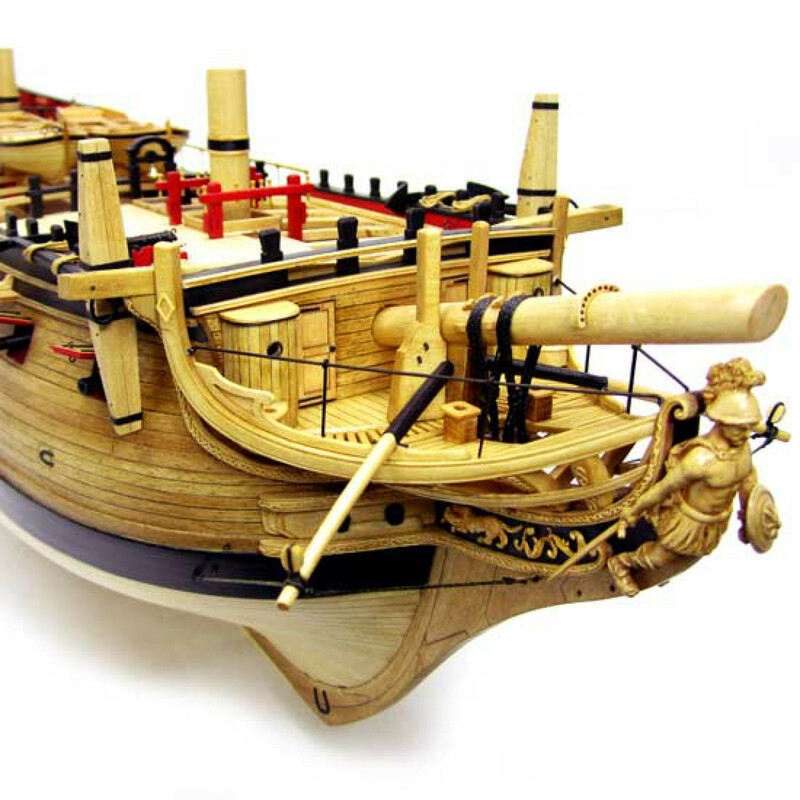 During 17th and 18th centuries, the Admiralty Board of the Royal Navy required builders to submit a model of a ship proposed for construction. Only then, upon consideration, would the Board approve funding for it. Called admiralty models, these were some of the finest ever made. They were unrigged with exposed hull and deck framing to allow inspection of the vessel's architecture, deck furnishings and decorative work in a three-dimensional format. 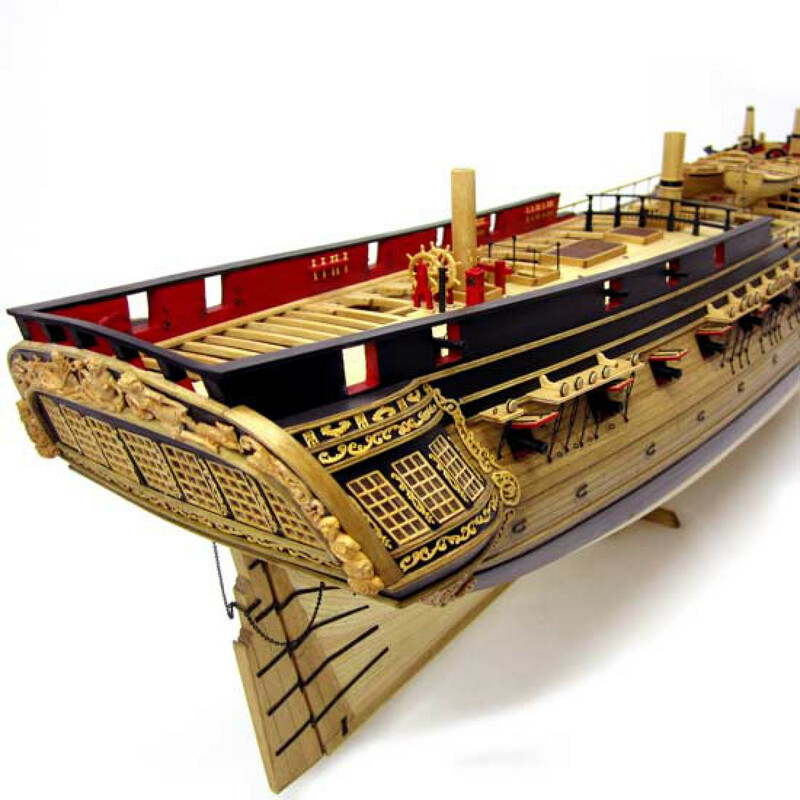 We've designed our kit as an admiralty model as well to show off the incredibly rich detail of its decks, furnishings and fittings. 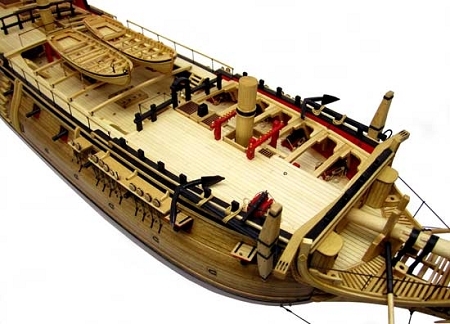 Additionally, the quarterdeck is left un-planked on the port side, leaving the great cabin and gun deck visible. Plank-on-bulkhead construction features laser cut basswood and walnut components, including port sills, lintels and uprights. 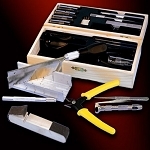 We supply nearly 400 basswood and walnut strips, over 250 boxwood blocks (for cannon), deadeyes, and 300 eyebolts. Other fittings include brass strips, tubes, nails and split rings; cast metal ship's wheel and anchors; blackened wire and four diameters of rigging line. Twenty-eight cast Britannia 12-pounder cannon and 4 six-pounders on wooden carriages replicate Confederacy's armament. Figurehead, stern decorations and other ornamental pieces are also cast metal. 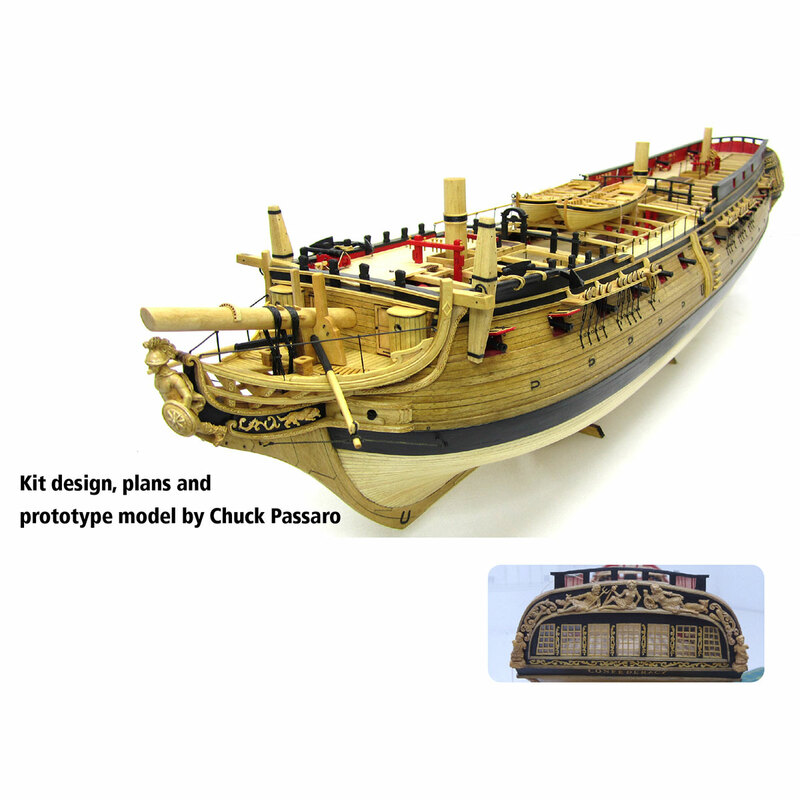 Two realistically detailed ship's boats are plank-on-bulkhead mini-kits with the center bulkheads removed, leaving fully framed shells lashed to skid beams. 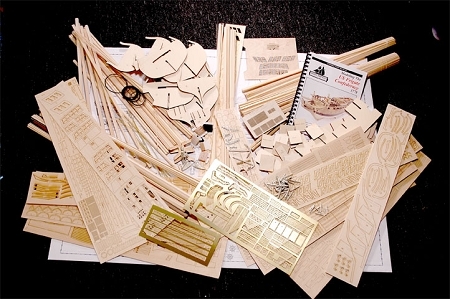 Kit includes laser cut display cradle. 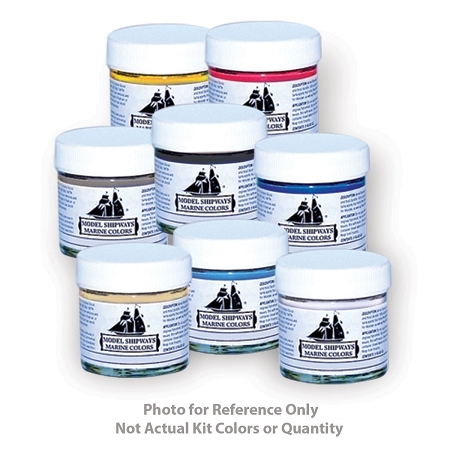 Designed by master modeler Chuck Passaro, Model Shipways' Confederacy is a monumental achievement. Five sheets of plans leave no detail unrecorded, and the 150-page illustrated step-by-step instruction manual is the most complete ever done. Hull Length 35" /Height 8-1/2" /Scale 3/16" = 1 ft.